To review 2015 I made a video that includes scenes of all the videos I published this year. It is a good tradition to look back at all that you’ve done in the year that is about to end, but I wanted to go further than just listing the best and the least often viewed videos. So for the first time I did a round-up of the all my own posts and videos of 2015 in one video! If you discover something of interest, that you may have missed or would like to see again, you can find descriptions of all the scenes, with a link to the original post, below the video. The year 2015 on my blog! A brand new bi-directional cycleway was built and opened this year on Reitscheweg in my hometown ʼs-Hertogenbosch. 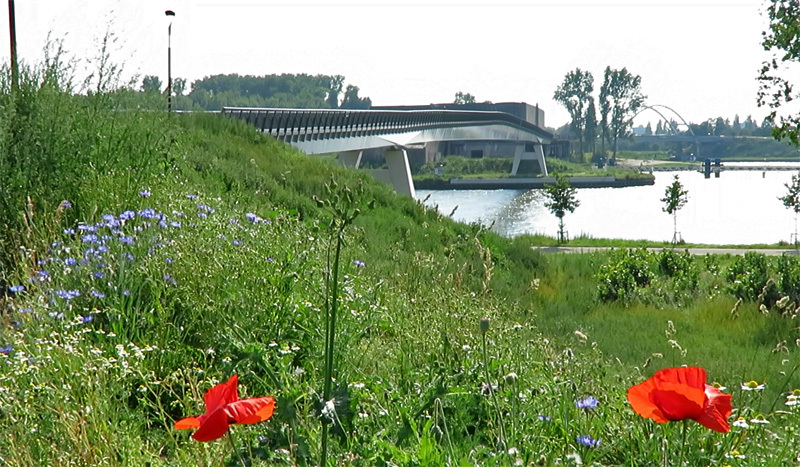 A very different type of cycleway was built in a new nature area alongside the also new Máximakanaal. It has a gravel surface! On the other side of that same canal we find a ‘regular’ cycleway: wide and with a smooth asphalt surface. More new cycle infrastructure in the recently built city expansion Groote Wielen. This is how the Dutch build cycleways today, when they have a blank canvas. A cycle tunnel under the railway from Nijmegen to Arnhem at Lent, in the new cycle route from Arnhem to Nijmegen. Finally in this section two examples of intercity cycleways, that we see more and more of in The Netherlands. In the South there is the Greenport Bikeway from the towns of Venlo to Horst-Sevenum and in the East we find the perfect fast cycle route from the cities of Arnhem to Nijmegen, the RijnWaalPad. The next section shows posts that inform you how the Dutch try to redesign areas in their cities to make them better for people. This can be done with simple bollards, but also with a complete redesign of a street. Sint Jacobsstraat in Utrecht is an excellent example. Sometimes I only showed the before situation such as the area around the Amsterdam Central Station where a lot of work is going to be done in the very near future. Already finished was the Mariaplaats in Utrecht and what a transformation it is! I also cycled in the Utrecht Sint Jacobsstraat to show you the transformation in a before and after side by side. That brings us to the next cluster of posts; the side by side comparisons. The first example is a missing link that was completed in the rural area just outside ʼs-Hertogenbosch. The example of the Troelstralaan in Utrecht shows you how a residential street was transformed into a cycle street where cycling has priority. Again in ’s-Hertogenbosch the Maastrichtseweg had a servicestreet 5 years ago. Now that is gone, as is most of the traffic and so the street could also become a cycle street. 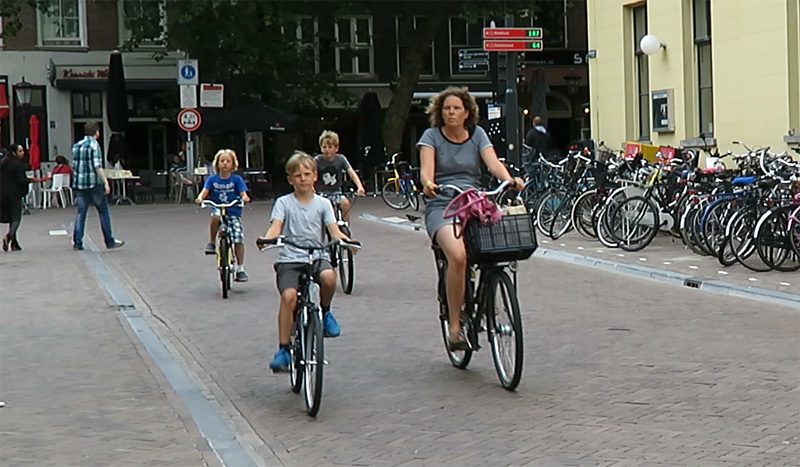 This woman cycles safely with three young boys in the reconstructed Mariaplaats in Utrecht. An entirely different example is Zandzuigerstraat in the same city. This arterial already had uni-directional cycleways on both sides of the road way, but the outdated surface of concrete tiles was changed into one of smooth asphalt. I also used the side by side comparison to show you how Dutch cities make sure cycling in the snow is possible. I used it in my presentation at the Winter Cycling Congress in Leeuwarden this year. The effort it takes to clear the cycleways of snow and ice is explained in another post and video. Snow doesn’t stop the Dutch from cycling in their typically Dutch way: holding hands is even possible in snow and with gloves on. Children standing tall on their parents’ bicycles is another habit that raised a lot of eye brows! Yes of course I had to show some bridges, but I only showed two real bridges – over water – in the entire year. One was a cycle bridge in Tilburg, the other a brand new and huge cycle bridge in Nieuwegein. All the other ‘bridges’ were really viaducts – over other traffic – such as the one between ʼs-Hertogenbosch and Rosmalen to lead you over a turbo-roundabout. The beautiful wooden cycle viaduct in Harderwijk makes crossing a motorway easy. As does the one in Maarssen. The north circular ring road of Utrecht can now also be crossed on another level; on a viaduct in Overvecht. A spectacular large cycle viaduct was opened in Naaldwijk. It lets you cycle over an even more spectacular large turbo-roundabout. The brand new cycle bridge in Nieuwegein crossing the Amsterdam-Rhine Canal. The first Dutch Garden bridge was opened in ʼs-Hertogenbosch. It is a “park on legs” that takes you over – among other things – rail road tracks. Virtually the only “tunnel” I showed you this year is of a stunning beauty. It is actually an underpass that takes you – almost at ground level – under raised rail road tracks. The ones of the Amsterdam Central Station. 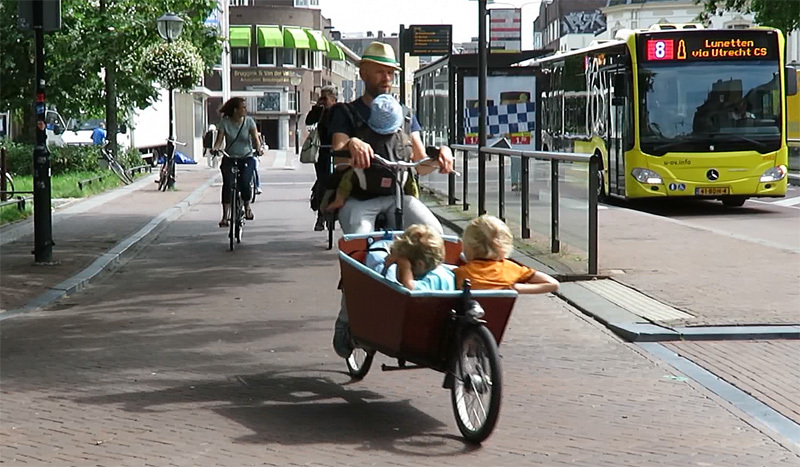 People love their cargo bikes in The Netherlands. A small group of people cycled the heart on the map of Utrecht in their Coeur bike Utrecht Tour with three rental cargo bikes. A several hundred cargo bikes could be seen riding in the streets of Nijmegen for the annual Cargo Bike Festival Tour. But you see cargo bikes “in the wild” as well. Riding in the Arnhem “Berenkuil” (Bear pit) for instance. A monumental bicycle roundabout at ground level with a raised motor traffic roundabout over it. The Berenkuil in Sint Michielsgestel was not so well executed. The roundabout for cycling at the bottom of the pit is a design mistake that still has to be corrected. Road designers who are not too familiar with designing for the bicycle exist even in The Netherlands and they make the same mistakes as everywhere else in the world: Bicycles are not mini-cars and you should not make mini versions of car infrastructure for them! 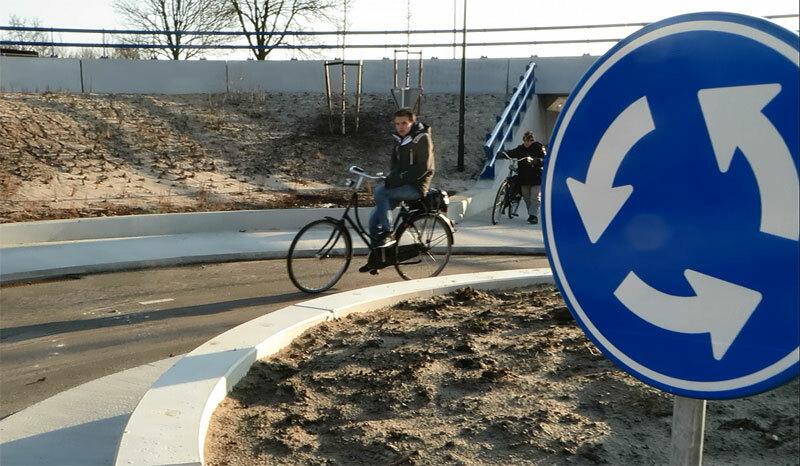 A bicycle-roundabout that shouldn’t have been built (like that) in Sint Michielsgestel. That there is nothing wrong with the concept of roundabouts is explained in a video that was used for presentations in North-America. Several of the roundabouts with priority for cycling – the preferred type in the built-up area – can be seen in the ride in the smaller town of Baarn. Another small town is Vught, the video of a ride there makes clear that even in those smaller towns the cycling infrastructure is mostly in very good order. Yet another ride is very different. A commute in Amsterdam, as filmed by a friend of mine. All over the world people are campaigning for better cycling conditions. Cycling experts from around the world came to Leeuwarden to the Winter Cycling Congress. I was invited to Russia, to explain about Dutch cycling in Saint Petersburg. I took the opportunity to look at cycling there. There is still a lot of work to do and campaigning is really necessary! That is also the case in Vught, where a reconstruction of a railway line and a motorway give cause for concern about the role of the bicycle in those big projects. A tour along some ‘problem points’ was organised by the local chapter of the Cyclists’ Union. What many also perceive as a ‘problem’ in this country is parking your bicycle. A ‘problem’ many others would like to have. Municipalities are working together with especially the railways to give people a good place to park their bicycles. I showed examples in Tilburg, Nijmegen and the giant underground bicycle parking facility at the new Delft Central Station. 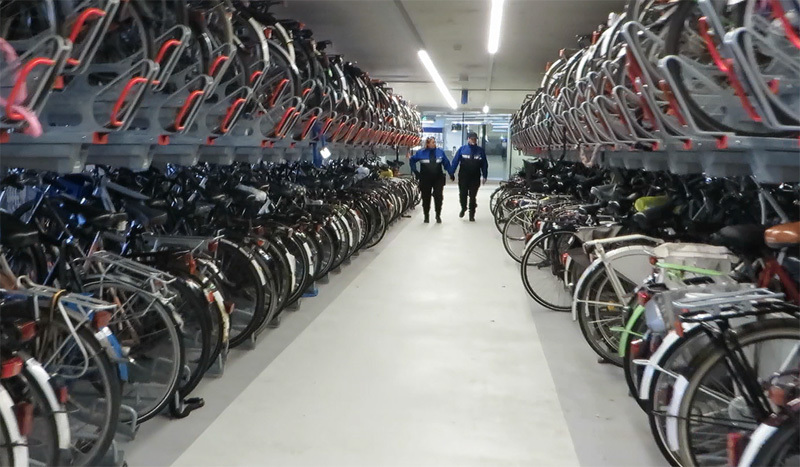 The bicycle parking facility as an integral part of the new Central Station in Delft. Finding such facilities is no longer a problem in Utrecht, where the world’s first real-time bicycle parking guidance system was festively opened this year. Utrecht had another innovative project: the Light Companion to lead you to the next green traffic light that was tested on the street. That wasn’t the only outdoor test. The railways asked the general public to test several types of the new OV-Fiets. The obstacle course made the test very appealing to many. Most of all I showed average people just going about their daily business on their bicycles. There was the Leeuwarden morning rush hour, the people using the Amsterdam Ferries, the evening rush hour in the dark in Utrecht and people riding at lunch time in that same city. Dressing for the occasion, not the ride. People in the traditional Carnival colours of ‘s-Hertogenbosch, red, white and yellow. 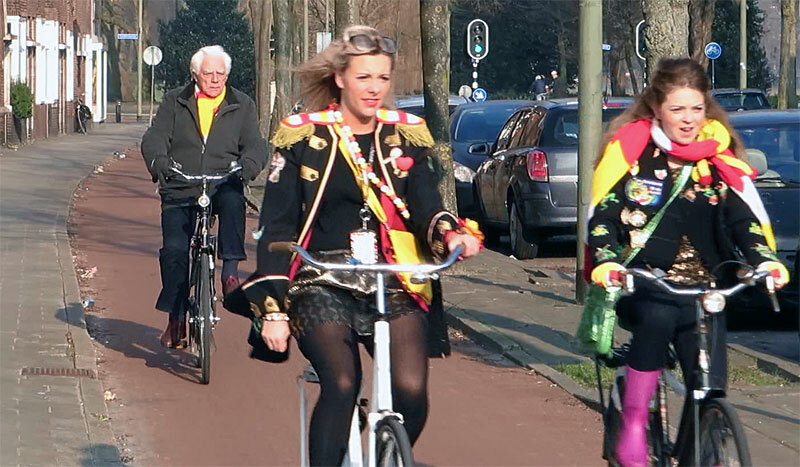 I also gave attention to people’s attire on their bicycle, but that the Dutch way. So I showed you people dressed for Carnival and King’s Day. It is only sometimes that people dress up for riding as seen in Leeuwarden, where people made sure they wouldn’t be cold during their ride. It is always fun to watch people riding their bicycles. Especially when they ride with their babies and toddlers. Something that you can see on every street and square in The Netherlands. In only a few countries in the world women cycle more than men. The Netherlands is one of these countries. Cycling even improves the cities and it doesn’t matter if the weather is good or if it rains. 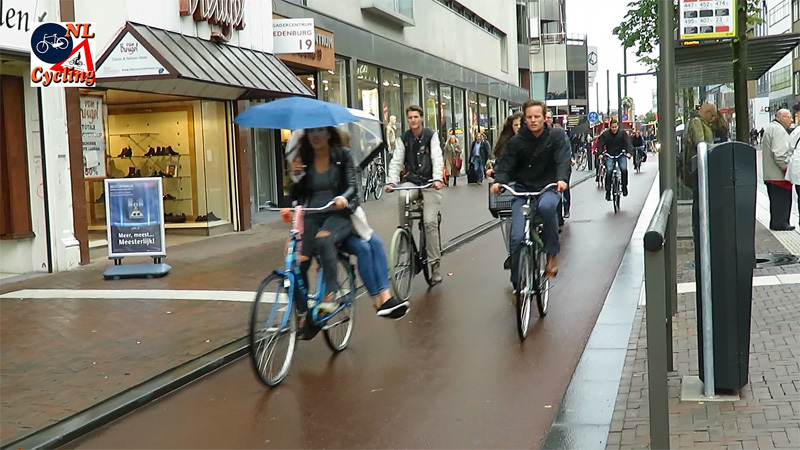 Cycling in the rain; no big deal in The Netherlands. That was the round-up of the 57 posts with video, that I created in 2015. But, for tradition’s sake, let’s also have a look at those lists! I love the fact that this is a nice mix of innovations, different types of good and bad infrastructure, in different weather conditions, watching people cycling, parking facilities and an exceptionally beautifully designed tunnel. The whole range of topics I find important to show. Very nice that that is exactly what you seem to want to see! What a pity that two of my personal highlights of the year – my trip to and my presentation in Saint Petersburg in Russia and my presentation at the Winter Cycling Congress in Leeuwarden – are among the least viewed posts. Apparently you rather learn about cycling in The Netherlands in the known format, than about my foreign trips. 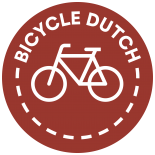 And that’s okay, this is a blog about Cycling in the Netherlands after all. 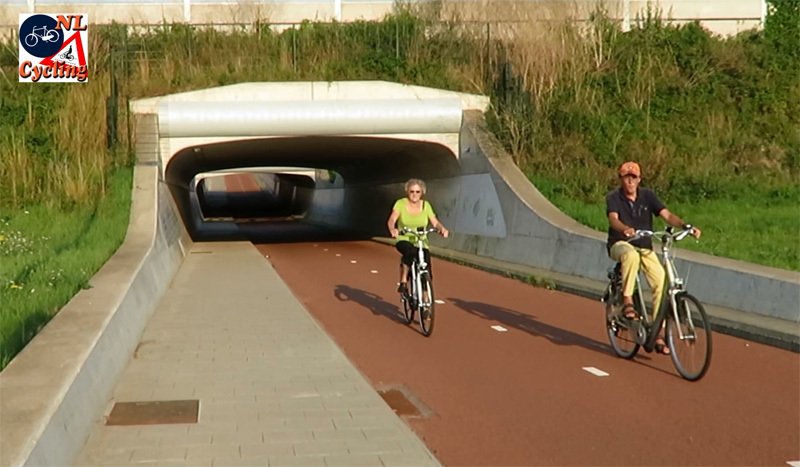 Cycling in the Netherlands is first and foremost a relaxed way to get from A to B. Thank you for all your support by visiting the posts, watching the videos and writing comments, here or on Twitter. Again, I met some of my followers in person, which is always great. Others gave me ideas for posts and yet others decided to support me financially with a donation. Which I appreciate very much, espcially because it makes all my travels in the country to go to those film locations possible! So thanks once again and make sure to visit my blog again in 2016! For I do intend to keep on showing you even more Cycling in The Netherlands! Fantastic. We have sooo far to go in England!!! Very fine posting and timing. The Atlanta Regional Commission is currently updating their Regional Bicycle and Pedestrian Plan. They are inviting input. I sent them the link to your latest posting which provides excellent samples of Dutch activities and accomplishments for 2015. Anyone interested in developing cycling should find your blog a terrific resource of information about so many areas of activities and infrastructure. I hope the commission will do themselves a favor and take a look. Nevertheless, keep up the great work Mark! Thank you for another year of video’s and blogposts. Merry Christmas and Happy New Year Mark! Vrolijk Kerstfeest en Gelukkig Nieuwjaar Mark (Did Google get the syntax right?)! It did. Thank you and the same to you! Interesting for one to see how their name looks in a different language. I’m guessing that the donations are buying your train tickets and OV Fiets bike charge. Even though that is only really 3 euro a day. And your coffee in the morning you went to Arnhem and other cities (I actually played a WW2 game where the mission simulated Market Garden)! The Dutch love their coffee. Literally and metaphorically (if you know about some drugs you know why I made this connection). Just the other day I went to a bike shop and got a new kickstand with a gift money from Christmas, and I cycled to the store, even in the cold, primarily to prove to my parents that it can be done even in my city. I wonder Mark what the coldest weather and strongest wind you’ve ever cycled into in your life that you can remember in all your 50 years. I cycled in minus 20C in the 1970s and 1980s but it hasn’t been that cold since. I wonder whether your blog might be so well known at some point that you might be able to do this full time. Not going to ask you how much you earn. You and the tax bureau can care about that, but breaking even on donations would be nice so that you could make even more videos. At that point it might be a good idea to get an E bike considering how long you would be cycling each day. This entry was posted on 29 December 2015 by Bicycle Dutch in Original posts and tagged infrastructure, watching people cycling.